Remove any course outer leaves from the cabbage outer and slice finely. Toss the cabbage with sea salt. Place and seal in a cryovac bag. Ferment at room temperature for five days, at which time it is ready to serve. Lightly toast the dry spices in a frying pan to bring out the flavours. Remove from the heat then add the ground coffee and salt. Use a spice grinder to blend spice mix together until coarsely ground. Sieve mix to remove any large pieces which can be reground as required. Keep sealed in a dry container, until needed. Place into a cryovac bag and seal. Sous-vide at 56.5°C for 40min. Remove beef fillet from the bag, lightly brush with olive oil and season with a generous coating of the coffee spice rub. Chargrill the fillet, turning regularly on all sides until the desired colour is reached. Rest before serving. Best served medium rare. Place the bunya nut meat into a cryovac bag and place in a steamer for 1 to 2 hours until the nuts are soft and cooked. Place desiree potatoes in a saucepan and cover with cold water. Bring to the simmer and cook until tender for approx 15 to 20min. Drain potatoes and pass through a ricer or mouli. Push the purée through a drum sieve to give you an ultra-smooth purée. Place puree into a mixer and whip with a paddle attachment. Keep the mixture warm. Bring the cream and butter to the simmer over medium heat. Gradually mixing while pouring, add the cream mixture to the potato purée, until it forms a soft purée. Add the bunya nut meat and mix together. Reserve and keep warm until ready to serve. Place mustard in a food processor and add the beetroot powder to reach the desired colour. Remove and place in a small squeeze bottle until ready to use. Sauté shallots in olive oil until golden in colour. Pour in shiraz, port, sherry vinegar and add herbs before bringing to a simmer. Reduce the wine solution to 1/3 of the original volume. Add the beef jus to the wine reduction and bring to a simmer for approximately 15 to 20min or until you reach a sauce consistency. Strain sauce into a clean saucepan and add the mulberries to the hot jus to infuse. Add the ground native pepper berry to reach the desired flavour. Put to one side until ready to use. Bring back to the simmer before serving. Using a concave silicon spatula, add a quenelle of the bunya nut puree to each plate. 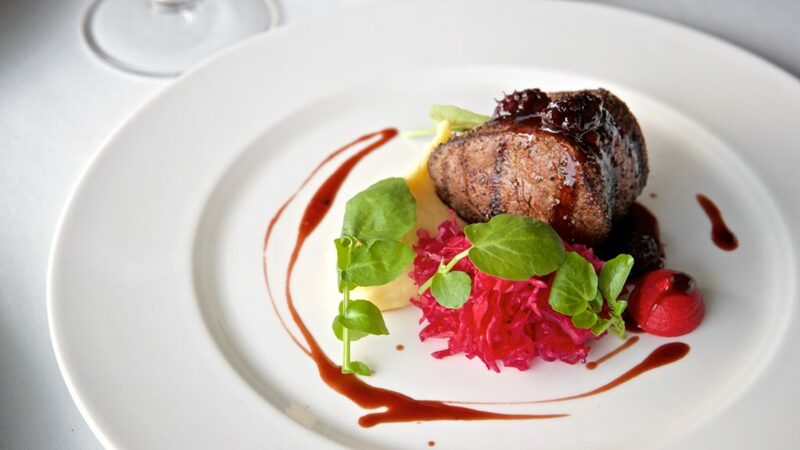 Arrange the beef fillet, fermented cabbage and ruby mustard then bring the mulberry jus back to the simmer before drizzling around the plate. Garnish with watercress to finish.